The da Vinci Surgical System is a sophisticated robotic platform designed to offer a state-of-the-art minimally invasive surgery. With da Vinci, small incisions are used to insert miniaturized wristed instruments and a high-definition 3D camera. Seated comfortably at the da Vinci console, the surgeon views a magnified, high-resolution 3D image of the surgical site inside your body. The surgeon controls four interactive robotic arms at the patient side cart from the surgeon console. Three of the arms are for inter-changeable tools such as graspers, scissors, needle drivers and bipolar diathermies. One arm is for a high- resolution 3D stereoscopic endoscope. 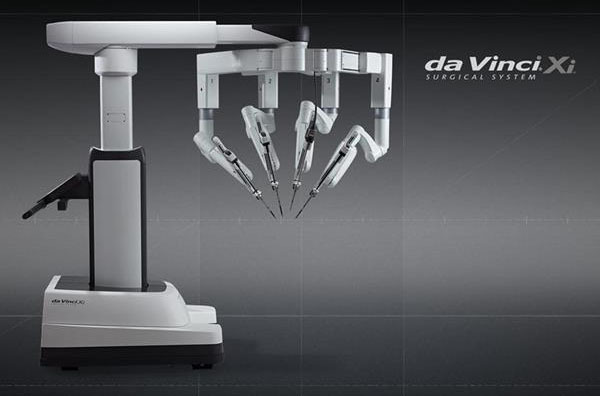 The da Vinci surgical system utilizes the latest robotic and computer technologies to scale, filter and seamlessly translate your surgeon's hand movements at the master controllers into precise micro-movements of the da Vinci instruments in the patient’s body. The instruments’ jointed-wrist design exceeds the natural range of motion of the human hand. Motion scaling and tremor reduction further interpret and refine the surgeon’s hand movements Although it is often called a “robot”, the da Vinci System cannot move or operate on its own; the surgeon is in full control. Multiple redundant safety features are designed to minimize opportunities for human error. By providing surgeons with superior visualization, enhanced dexterity, greater precision and ergonomic comfort, the da Vinci Surgical System makes it possible for surgeons to perform minimally invasive procedures involving complex dissection or reconstruction. For the patient, a da Vinci procedure can offer all the potential benefits of a minimally invasive procedure, including less pain, less blood loss and less need for blood transfusions. Moreover, the da Vinci System can enable a shorter hospital stay, a quicker recovery and faster return to normal daily activities. The results of the operation is very much dependent on the experience of the robotic surgeon. The information on this website is for your general knowledge and is not a substitute for medical advice from your General Practitioner or Specialist Urologist.